​and Genetic Recombination on Bacteria! So, what is the big deal with DNA? What does it do? ​•Functional unit of genetic information is the gene. •Genes are part of genetic elements: large molecules and/or chromosomes. •DNA (genetic blueprint) and RNA (transcription product) are polynucleotides. 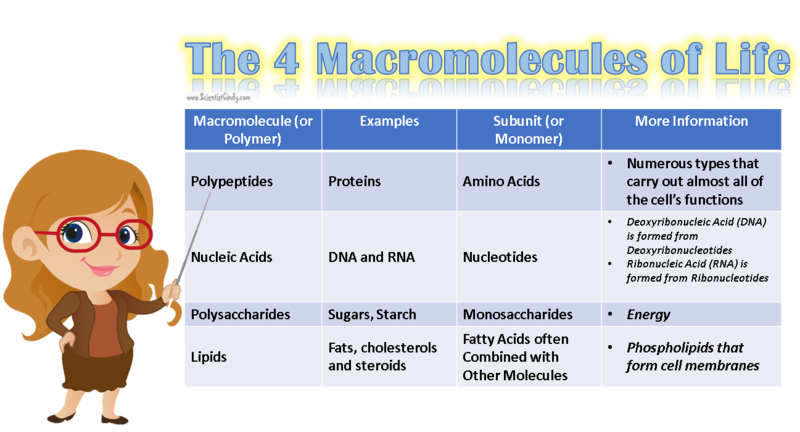 •Informational macromolecules include nucleic acids and proteins. Hydrogen bonds are relatively weak. It is important for the hydrogen bonds to be able to be broken when the cell needs access to the individual DNA strands. For example, the two DNA strands need to be separated for DNA replication during reproduction and to make the mRNA template during transcription. The DNA strands are oriented antiparallel to one another. The ends of the DNA molecule are different. One end of the DNA molecule is designated 3' (stated as 3 prime) and the other as 5' (stated as 5 prime). They are names according to the carbons in the ribose sugar molecule of the DNA backbone. In a molecule of DNA, one strand will be oriented from 3' to 5', and the other from 5' to 3'. DNA as Their Genetic Material. Prokaryotes, like bacteria, and eukaryotes are considered to be living organisms. The current criteria for life includes that all lifeforms must consist of one or more cells. Viruses are not made up of cells, so they are not currently considered to be living organisms. Many scientists believe the criteria for life is outdated and should include viruses. Another criterion of life is that all lifeforms must have a means of reproduction. Viruses do have the ability to reproduce, but only with the assistance of a host cell. Viral genetics and reproduction strategies will be discussed later on this page. Bacteria cells are prokaryotic and are much smaller than the eukaryotic cell. They do not have any membrane-bound organelles. Also, bacteria cells do not have a nucleus, but they do have a region called the nucleoid, which is a region in which the DNA can be found. Both bacteria and eukaryotes (animals, plants fungi and algae) are able to reproduce. We will narrow our focus by comparing animal cells specifically (as an example of eukaryotic cells) with bacteria cells. In order for reproduction to occur, the DNA must be replicated. This process is simply called DNA Replication. Prokaryotic cells have no nucleus, no organelles and a small amount of DNA in the form of a single, circular chromosome. Eukaryotic cells on the other hand, have a nucleus, multiple organelles and more DNA arranged in multiple, linear chromosomes. Prokaryotic cells have DNA in the form of one single, circular chromosome. Eukaryotic cells have DNA arranged in multiple, linear chromosomes. Archaea cells also have their DNA packages by histone proteins, but the DNA is in the nucleoid region which is part of the cytoplasm. 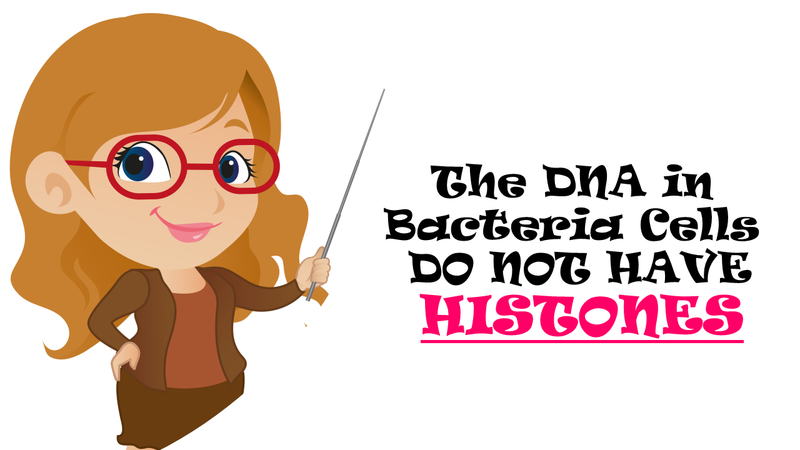 Bacteria do not have histone proteins. Prokaryotic cells undergo cell division using binary fission; an asexual process that produces 2 genetically identical daughter cells from a single parent cell. prokaryotic cells are haploid; they have only one copy of their genome. 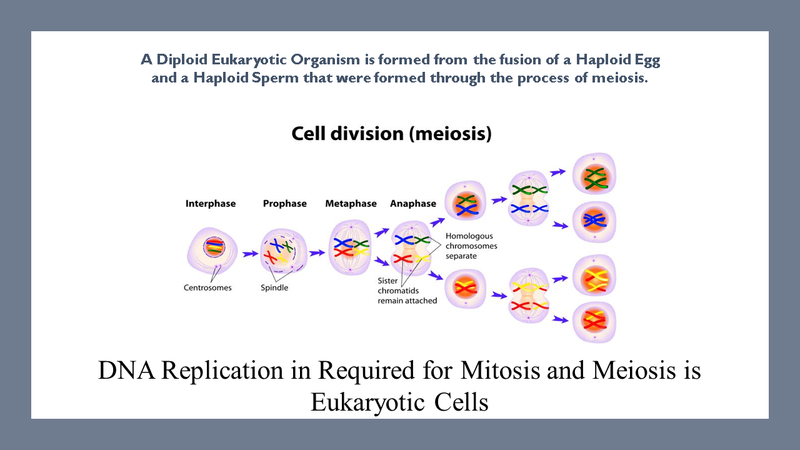 Eukaryotic cells undergo cell division using either the process of mitosis or meiosis. mitosis is an asexual process that produces 2 genetically identical daughter cells from a single parent cell. This process is performed by somatic cells. The parent cell and resulting daughter cells are diploid. Begins at a Single Point of Origin. This is known as the "Origin of Replication" (Ori). Begins at Thousands of Points of Origin. These are known as the "Origins of Replication" (Ori). 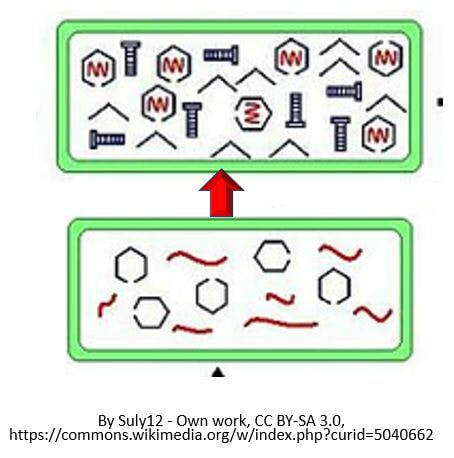 Circular bacterial chromosomes are replicated bidirectionally, starting at one point of origin and replicating in two directions away from the origin. 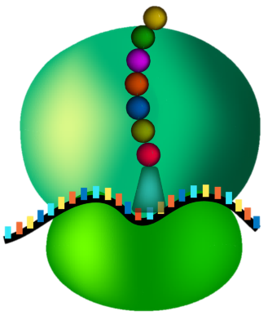 This results in semi-conservative replication, in which each new identical DNA molecule contains one template strand from the original molecule, shown as the solid lines, and one new strand, shown as the dotted lines. A Diploid Eukaryotic Organism is formed from the fusion of a Haploid Egg and a Haploid Sperm that were formed through the process of meiosis. Eukaryotic cells carry two copies of each chromosome; one copy from each parent. Because eukaryotic cells have 2 sets of chromosomes, they are considered ​diploid. Diploid offspring are formed from the fusion of a haploid egg (carrying one complete set of genes from the mother) combining with a haploid sperm (carrying one complete set of genes from the father) during fertilization. This process creates genetically unique offspring. Bacterial cells reproduce using binary fission, which is an asexual process. ​ Since there is only one copy of the chromosome, bacterial cells are considered haploid. 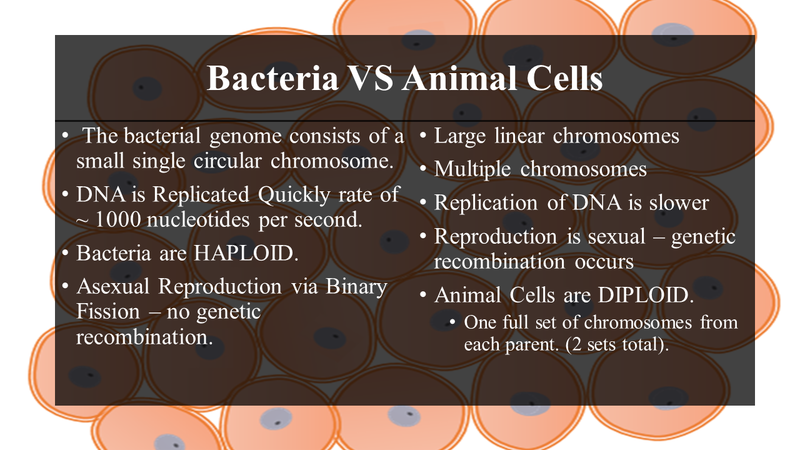 Bacteria cells are haploid which means they contain a single set of genes that they inherit from a single parent cell through the asexual process of reproduction known as binary fission. The bacterial genome consists of a small single circular chromosome. The entire bacterial genome can be replicated in under an hour, at a rate of ~ 1000 nucleotides per second. The DNA in bacteria exist in a region called the nucleoid. The nucleoid is simply a "cytoplasmic location" and not a membrane-bound organelle, like our nucleus. However, the nucleoid does succeed in packaging the DNA into a small space within the cytoplasm. ​Proteins assist in anchoring the genetic material to the nucleoid. Bacteria are small, and the nucleoid takes up almost 1/3 of the space in the cell!. ​Helicase separates the DNA to form a replication fork at the origin of replication, Replication forks extend bi-directionally as replication continues. Okazaki fragments are formed on the lagging strand, while the leading strand is replicated continuously. DNA ligase seals the gaps between the Okazaki fragments. Primase synthesizes an RNA primer with a free 3′-OH, which DNA polymerase III uses to synthesize the daughter strands. This genetic replication process requires the enzyme DNA polymerase (DNA pol). DNA Pol III is the enzyme required for DNA synthesis in bacteria. DNA pol III adds the individual nucleotides according to their complementary base. Adenine (A) will hydrogen bond with Thymine (T). Cytosine (C) will hydrogen bond with Guanine (G). A replication fork is formed when helicase separates the DNA strands at the origin of replication. Topoisomerase I and II break and reform DNA’s phosphate backbone ahead of the replication fork, thereby relieving the pressure that results from this supercoiling. The DNA tends to become more highly coiled ahead of the replication fork. SEE VIDEO! 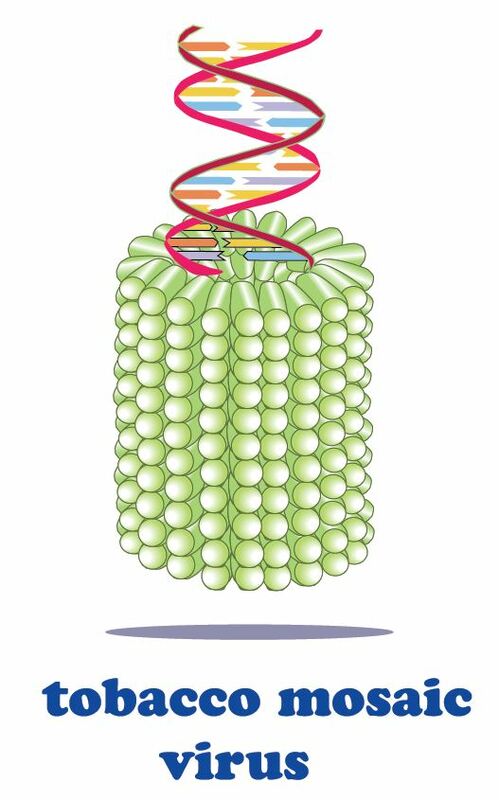 Single-strand binding proteins bind to the single-stranded DNA to prevent the helix from re-forming. • There are specific nucleotide sequences called origins of replication (Ori) located on the bacterial chromosome.The Ori is the point at which DNA replication begins. Prokaryotic organisms will have a single origin of replication. ​Eukaryotic DNA can be about 50 times larger than the prokaryotic genome. 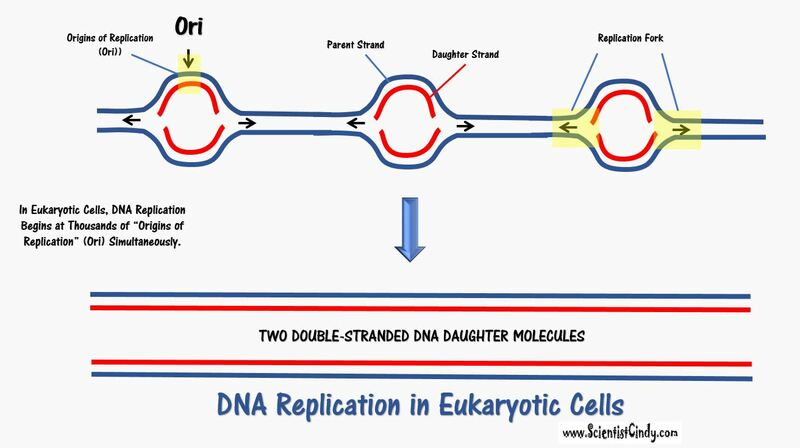 Since so much DNA must be copied in the eukaryotic cell, we have thousands of origins of replication (Ori) all working at the same time. DNA polymerase is able to add nucleotides only in the 5′ to 3′ direction (a new DNA strand can be extended only in this direction). It also requires a free 3′-OH group to which it can add nucleotides by forming a phosphodiester bond between the 3′-OH end and the 5′ phosphate of the next nucleotide. RNA primase, synthesizes an RNA primer that is complementary to a short sequence of DNA. The RNA primer provides the free 3′-OH end needed to allow replication to occur. 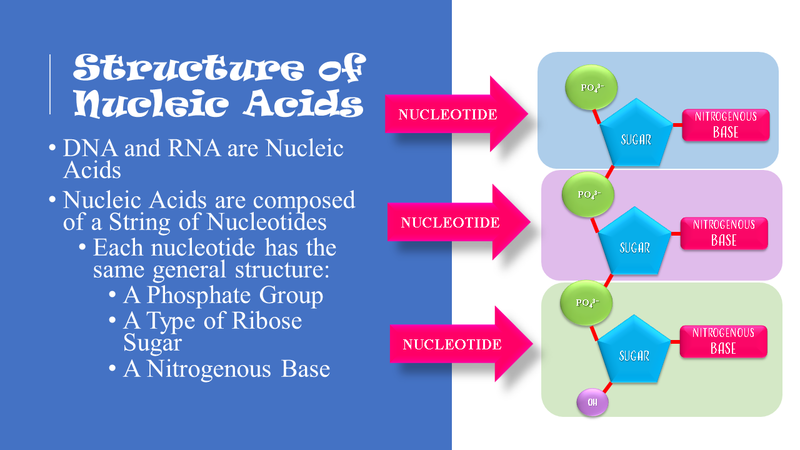 RNA pol III then begins adding nucleotides one by one that are complementary to the template (parent) DNA strand. A primer is a short single strand of RNA or DNA (generally about 18-22 bases) that serves as a starting point for DNA synthesis. It is required for DNA replication because the enzymes that catalyze this process, DNA polymerases, can only add new nucleotides to an existing strand of DNA. The polymerase starts replication at the 3′-end of the primer, and copies the opposite strand. 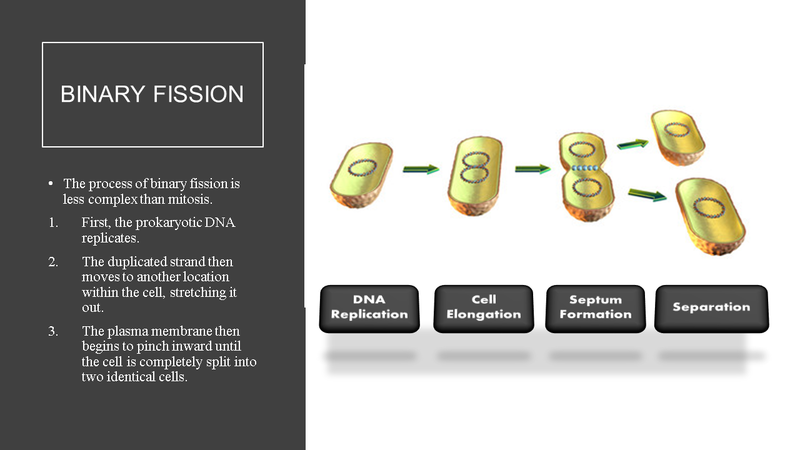 ELONGATION - After initiation, the DNA is ready to be replicated. This occurs quickly in the bacterial cell (approximately 1000 nucleotides per second). The main idea of elongation is that the DNA Polymerase III will add on complimentary nucleotides (according to the rules of base-pairing). DNA Polymerase III can only synthesize DNA in the 5’ to 3’ direction. This fact creates a difficult situation. You see, DNA is double stranded with each of those strands being reversed or antiparallel. In other words, one strand is oriented in the 5’ to 3’ direction and the other is oriented in the 3’ to 5’ direction. The consequence of this antiparallel configuration, coupled with the factor that DNA Pol III can only synthesize DNA in the 5' to 3' direction, is that one of the DNA strands will be replicated continuously, but the other will not! Leading Strand - The parent strand of DNA which runs in the 3' to 5' direction toward the replication fork. It has the ability to be replicated continuously by DNA polymerase. The lagging strand of DNA is that strand of the DNA double helix that is orientated in a 5′ to 3′ manner. Therefore, its complement must be synthesized in a 3′→5′ manner. Because DNA polymerase III cannot synthesize in the 5′→3′ direction, the lagging strand is synthesized in short segments known as Okazaki fragments. Along the lagging strand's template, primase builds RNA primers in short bursts. DNA polymerases are then able to use the free 3′-OH groups on the RNA primers to synthesize DNA in the 5′→3′ direction. DNA polymerase III uses the RNA primer to synthesize the daughter DNA strand. On the leading strand, DNA is synthesized continuously, whereas on the lagging strand, DNA is synthesized discontinuously as Okazaki fragments. On the Leading Strand, DNA Polymerase III follows helicase and adds on nucleotides according to complementary bases in the 3' to 5' direction. This is considered continuous replication. On the Lagging Strand, DNA Polymerase III will replicate short portions of DNA at a time, called Okazaki Fragments. This is considered discontinuous replication. DNA polymerase I replaces the RNA primer with DNA. ​The RNA fragments are then removed by DNA polymerase I for prokaryotes or DNA polymerase δ for eukaryotes and new deoxyribonucleotides are added to fill the gaps where the RNA was. DNA ligase seals the gaps between the Okazaki fragments, joining the fragments into a single DNA molecule. ​DNA Ligase is the enzyme that functions to connect the Okazaki Fragments together for the copy of the lagging strand. The word "ligate" in Latin means "to tie together." ​DNA ligase then joins the deoxyribonucleotides together, completing the synthesis of the lagging strand. TERMINATION - After the full chromosome has been replicated, termination of DNA replication must occur. Since the bacterial genome consists of a single circular chromosome, at the end of the elongation step of DNA replication, you end up with 2 interlocking circles of DNA. The scientific terms, you would say that the parent DNA and the daughter DNA molecules are concatenated., These concatenated DNA chromosomes must be separated. Bacterial Topoisomerase IV induces a double-strand break into the DNA molecules, allowing them to separate from each other (becoming un-concatenated). Bacterial Topoisomerase IV then reseals each DNA molecule back together again creating 2 separate, un-linked chromosomes. 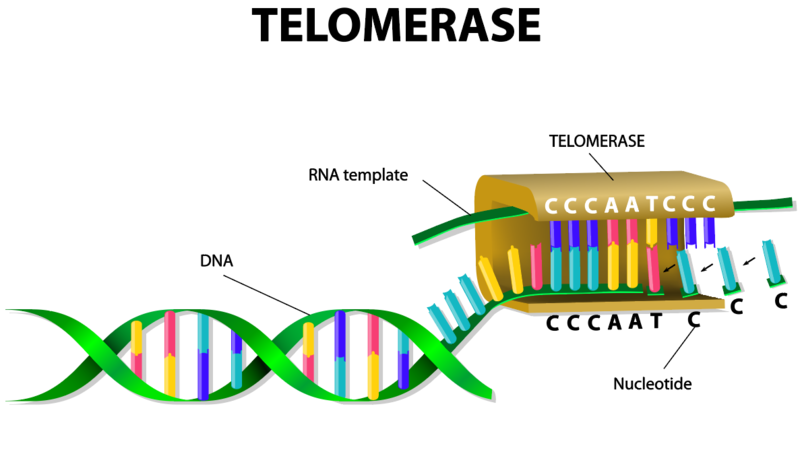 telomerase: an enzyme in eukaryotic cells that adds a specific sequence of DNA to the telomeres of chromosomes after they divide which rebuilds the telomeres after cell division in some eukaryotic cells. The chromosomes of eukaryotes are linear, which causes an issue with the termination step of DNA replication. Some cells have the ability to reverse telomere shortening using telomerase, an enzyme that extends the telomeres of chromosomes. The enzyme telomerase has a built-in RNA template so it can add on more of the repeated segments of DNA to the ends of the telomeres. In humans, telomerase is typically active in eggs and sperm cells (gametes) and adult stem cells, but it is not active in other cells. It is currently believed that telomere shortening causes signs of aging of these cells. DNA replication begins at a specific spot on the DNA molecule called the origin of replication. At the origin, enzymes unwind the double helix making its components accessible for replication. Each strand of the helix then separates from the other, exposing the now unpaired bases to serve as templates for new strands. A small segment of RNA is added as a primer, then new nucleotide bases that complement the unpaired bases can be assembled to form two daughter strands next to each parent strand. This assembly is accomplished with enzymes called DNA polymerases. When the process is complete, two DNA molecules have been formed identical to each other and to the parent molecule. The steps for DNA replication are generally the same for all prokaryotic and eukaryotic organisms. Unwinding the DNA is accomplished by an enzyme named DNA helicase. Both eukaryotic and prokaryotic organisms use DNA polymerases for DNA replication. The types of RNA polymerases used are structurally different, but the function is very similar. DNA polymerases require the presence of an RNA primer which is paired with a template strand. Both types of organisms also begin new DNA strands with a small primer of RNA. In this pattern, the individual strands of DNA are manufactured in different directions, producing a leading and a lagging strand. 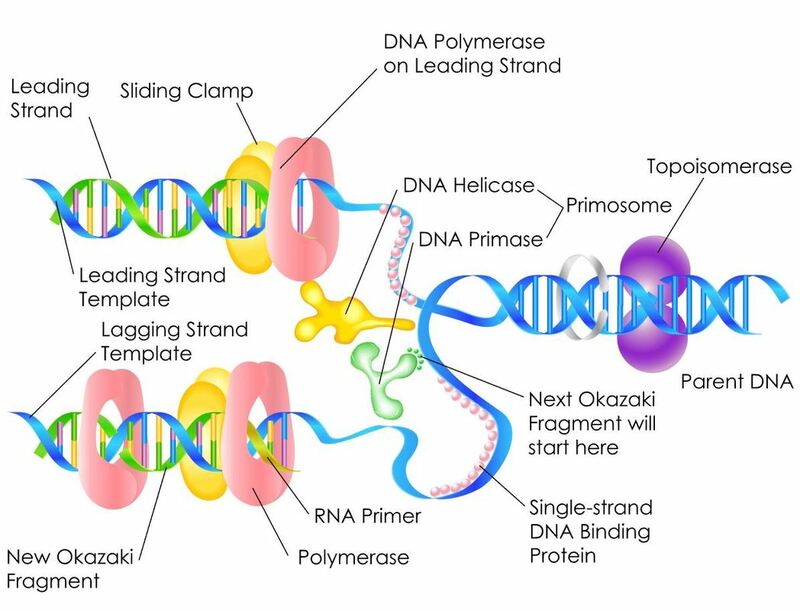 Lagging strands are created by the production of small DNA fragments called Okazaki fragments that are eventually joined together. 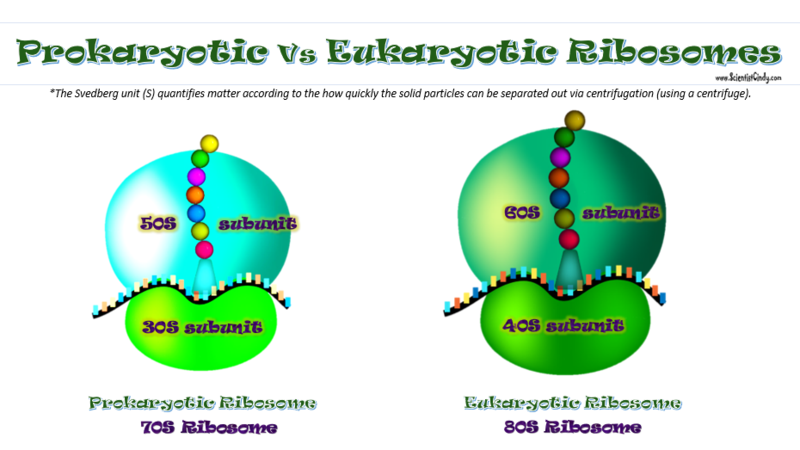 The average eukaryotic cell has a lot more DNA than a prokaryotic cell. 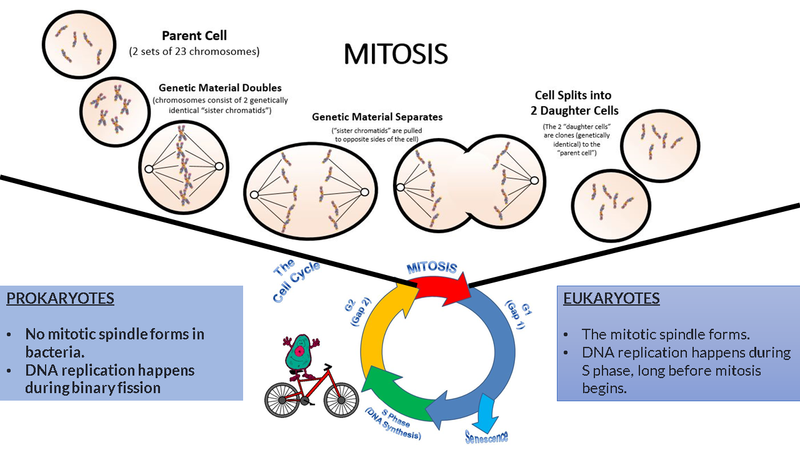 Eukaryotic cells undergo DNA replication in the nucleus of the cell. Eukaryotic chromosomes experience telomere shortening due to the linear nature of their chromosomes. Prokaryotic cells do not contain telomeres. Bacteria contain a single circular chromosome which can be found in a general region called the nucleoid. 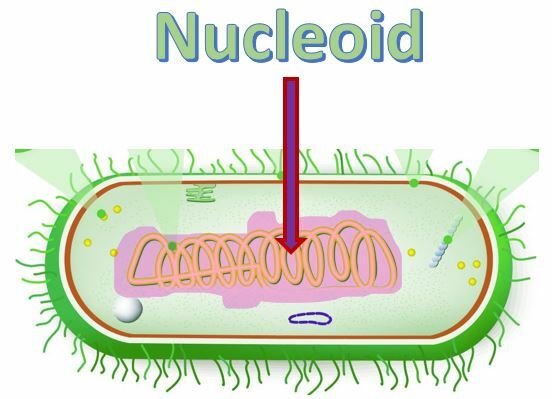 Bacteria cells do not have a nucleus and do not contain any membrane-bound organelles. Bacteria only reproduce asexually through a process called binary fission which produces genetic clones. There is no genetic diversity (or genetic recombination) introduced in bacterial cell division! In addition to the single circular chromosome, some bacteria may contain additional small pieces of DNA called plasmids. Plasmids are small circular pieces of DNA that can contain between 1 and 10 genes (or so). Plasmids are going to be very important in terms of genetic recombination that takes place in bacteria. Bacteria have the ability to transfer these plasmids from one bacteria to another bacteria in order to create genetic variation. We see evidence of genetic recombination, when we are able to observe bacterial growth under conditions in which growth should not have occurred. Let's break down an example of this idea. Here is the necessary background information that is important to know in order to understand the example below. When bacteria grows on a Petri dish, they form colonies. A single colony consists of thousands of bacteria. The growth media used in this experiment lacks both arginine (arg) and tryptophan (trp). Both arginine and tryptophan are needed for bacterial growth. If a bacterial cell has the ability to make its own arginine AND tryptophan, then it will be able to grow (as colonies) on this growth media. However, a bacteria cell that lacks the ability to create either arginine (arg) or tryptophan (trp) will not be able to grow on this growth media. In the illustration, the first bacterial strain (left) carries the gene to create arginine (arg+), but it does NOT have the gene that creates tryptophan (trp-). Since the bacteria lacks the gene needed to create tryptophan, it will not grow on this growth media (no colonies will form). The bacterial strain on the right has the gene for tryptophan ( trp+) but does NOT have the gene for arginine (arg-). Since this bacteria cannot make its own arginine, no colonies will form using this growth media. 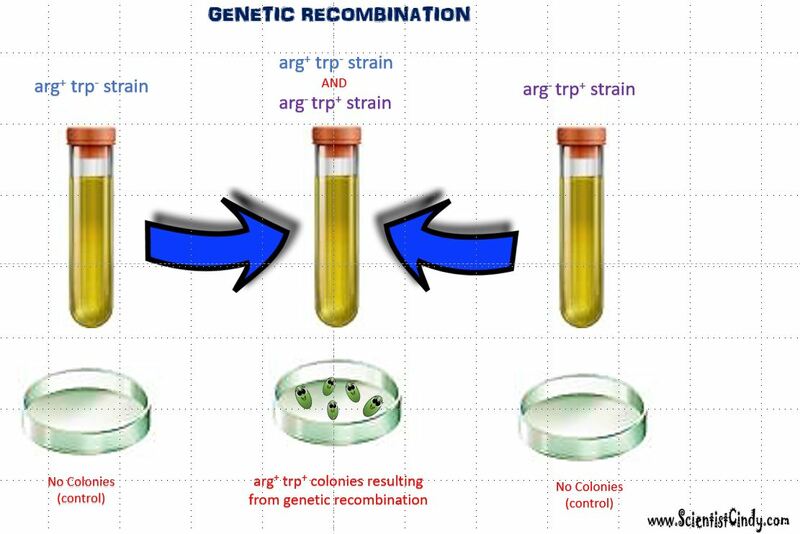 However, when the two strains (arg+ trp-) and (arg- trp+) are combined in the same test tube, colonies are able to form on the Petri dish. This could only occur if the bacteria had somehow possessed the genes needed to produce both arginine and tryptophan. There are 3 different methods by which genetic information​ can be exchanged in bacteria. Also known as horizontal gene transfer (HGT). Transformation - Transformation is when a bacteria takes in plasmids from their environment. In order to take in a plasmid from the environment, microbiologists must "induce competency". There are several methods used in laboratories to induce competency. 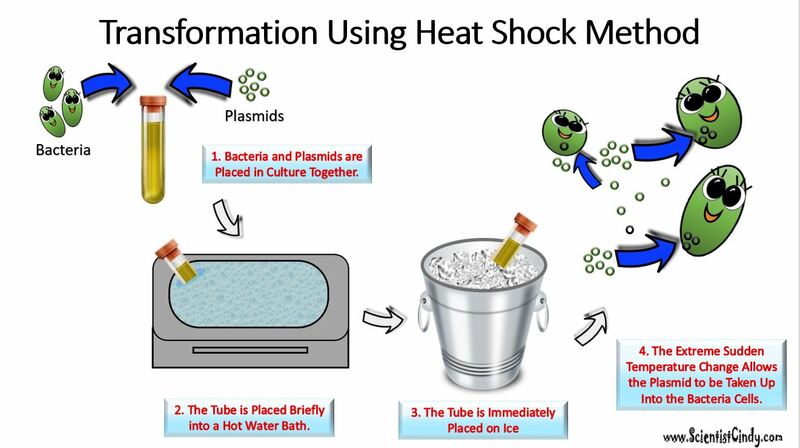 One of the most popular and easiest ways to induce competency in bacteria, is the "heat shock" method. Heat shocking involves exposing the bacteria to a moderately high temperature (42 degrees Celsius is common) for a brief amount of time (usually no more than 45 seconds). Immediately following the heat exposure, the culture is then put on ice. Natural transformation occurs in some bacterial species without the assistance of laboratory manipulation. There are currently 67 known bacterial species that are able to undergo this form of horizontal gene transfer. The ability depends on the expression of numerous bacterial genes whose products are responsible for this process. In general, transformation is a complex, energy-requiring developmental process. In order for a bacterium to bind, take up and recombine exogenous DNA into its chromosome, it must become competent. To become "competent" the bacterium must enter a special physiological state. The DNA taken up from the environment will usually become integrated into its genome. This process is usually occurs among bacteria belonging to the same species, though exceptions have occurred. The phage is going to land on a bacteria cell (or bacterium). The new phages leave the host cell. Occasionally, some phages may have some of the bacteria's DNA inside of it when the exit the host cell. 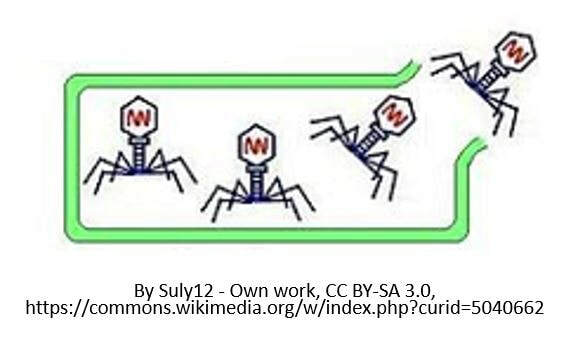 In these cases, in which the phages are carrying bacteria DNA, these phages will brings that foreign bacterial DNA with it when it infects the next host cell. This time, when the phase goes to injects its DNA into the host cell, the bacterial DNA will be transferred to the "would-be" host cell instead! The process is the same as generalized except that the phage is going to utilize the lysogenic cycle. This bacterial DNA will get transferred to any new host cell the virus infects next. 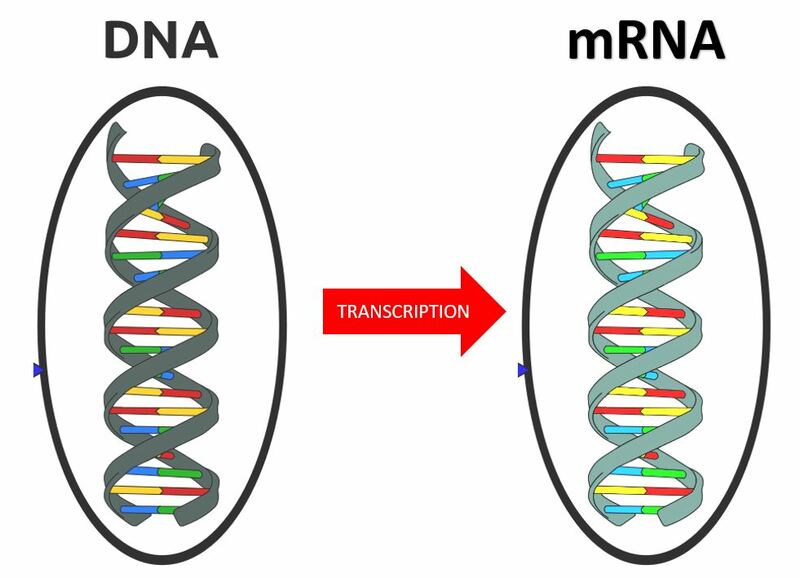 Transcription involves making mRNA using DNA as a template. Translation then translates the mRNA sequence into an amino acid sequence to form a protein. The genome is organized into specific sequences of nucleotides that lead to specific characteristics or features called genes. These genes cause such characteristics or features to come about through the process of transcription followed by translation. These genes are transcribed as messenger RNA (mRNA), which then gets translated into individual amino acids that will be linked together like beads on a strings to make a protein. In other words, the genome specifies the amino acid sequence that makes up the protein. The genotype of a cell is the actual genes contained in a cell. Only some of the genes that make up the cell's genotype gets expressed (turned into protein through transcription and translation). For this reason, we make a distinction between the genotype itself, which is the actual genes of the cell, and the phenotype, which refers to the characteristics of a cell that are a product of the expression of only some of those genes. full collection of genes a cell contains. The phenotype is a cell’s observable characteristics resulting from the expression of specific genes proteins it is producing at a given time under specific environmental conditions. Protein synthesis in bacteria cells is much simpler than it is in eukaryotic cells. Bacterial DNA does not contain introns (regions of DNA that do not code for protein). Also, the bacterial has no nucleus for transcription to take place in when the DNA gets transcribed into messenger RNA. The process in bacteria cells, does not involve any processing of the messenger RNA. The messenger RNA will simply travel directly to a ribosome, where it will then be translated into a protein. Interestingly, ARCHAEA DO HAVE INTRONS. RNA transcription in bacteria is done in the cytoplasm, not in the nucleus like in eukaryotic cells. Transcription in bacteria is done using an enzyme called RNA polymerase. RNA Polymerase functions in a similar manner as DNA Pol III does in DNA Replication in Bacteria. 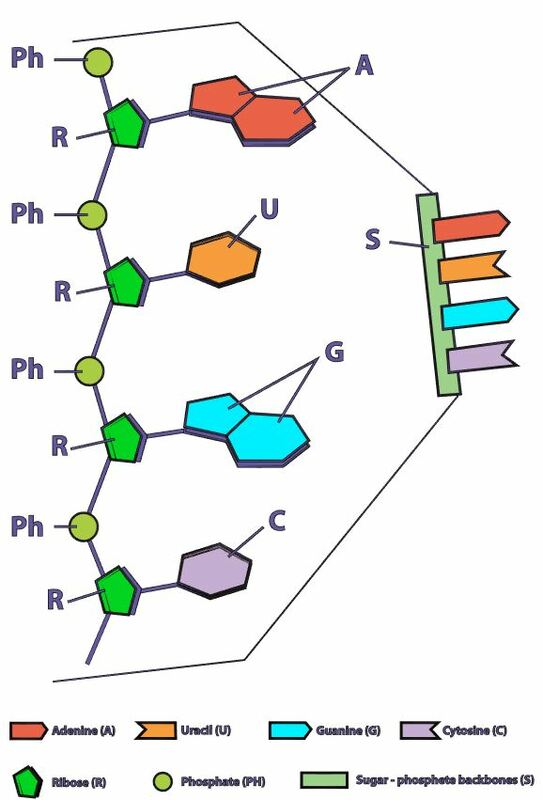 RNA Polymerase adds nucleotides according to their complementary bases using a free 3’-OH group of the growing nucleotide chain. RNA transcription requires a promoter. A promoter is a DNA sequence that transcription factors bind to. Promoters are located “upstream” from the sequences that code for proteins. The nucleotides that code for proteins would be considered to be located “downstream” from the initiation site (which is where transcription begins). The –10 consensus sequence, called the TATA box, is TATAAT. The –35 sequence is recognized and bound by Sigma. Once all of the relevant transcription factors have bound to the promoter, the elongation in transcription phase begins. In this part of RNA transcription, the sigma subunit of the RNA polymerase falls off which allows RNA transcription to begin. The RNA nucleotides are added in a complementary fashion to the DNA template in a 5’ to 3’ direction at a rate of approximately 40 nucleotides per second. 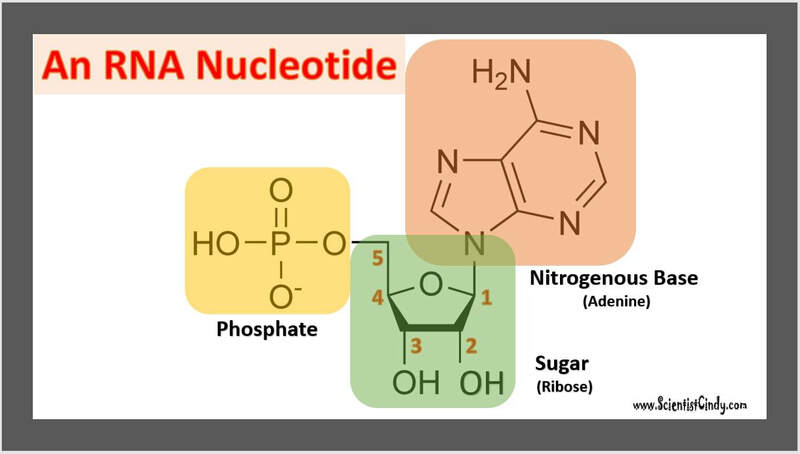 RNA does not have thymine (T), so when the DNA template contains a nucleotide with an adenine (A) base, it will add a nucleotide with Uracil (U) instead. Transcription of RNA is terminated when the bacterial RNA polymerase dissociates from the DNA template and releases the newly made RNA. This is accomplished through a terminating sequence (a repeated nucleotide sequence) that signals the RNA polymerase to terminate the process. Genes are segments of nucleic acid sequences that will code for proteins that exhibit a specific genetic trait. The process by which the genetic sequence gets expressed into protein is a two-step process. The first step is transcription which is explain above. 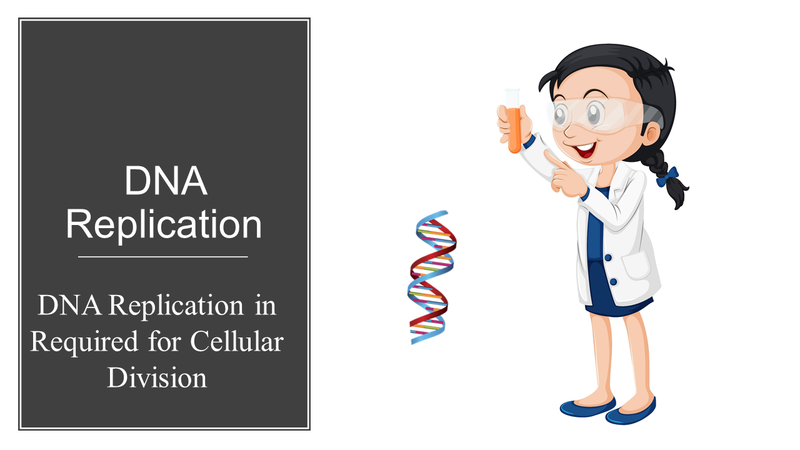 In short, transcription involves using the DNA molecules as a template to form messenger RNA (mRNA). The second and final step of this process is called translation. Translation is the process by which the mRNA sequence will be translated into an amino acid sequence which makes up a protein. Initiation In bacteria, translation of mRNA into an amino acid sequence begins with the formation of an initiation complex. The initiation complex is formed when the mRNA, the tRNA, and the first amino acid all come together within the ribosome. The nucleotide sequence of mRNA is read in triplets called codons. All translation begins with what is called "the start codon" which is AUG. This means that the first 3 bases on the mRNA are Adenine (A), Uracil (U) and Guanine (G) = AUG. The AUG codon codes for the amino acid methionine. 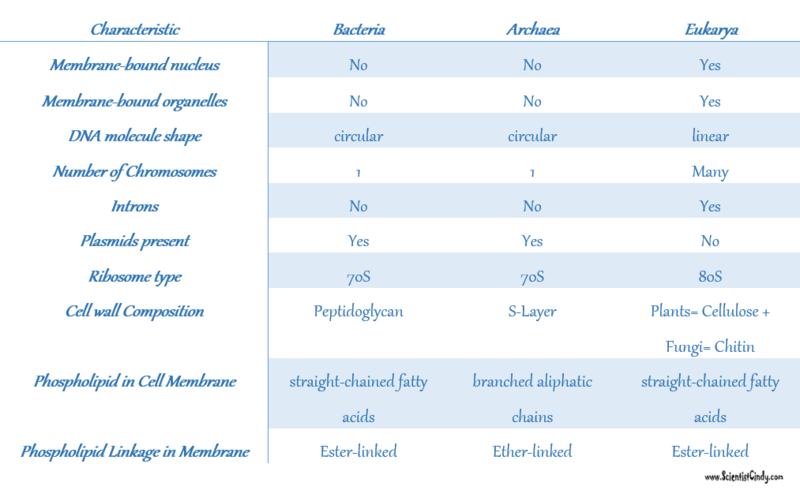 The types of ribosomes found in bacteria and archaeal cells are different from one another. 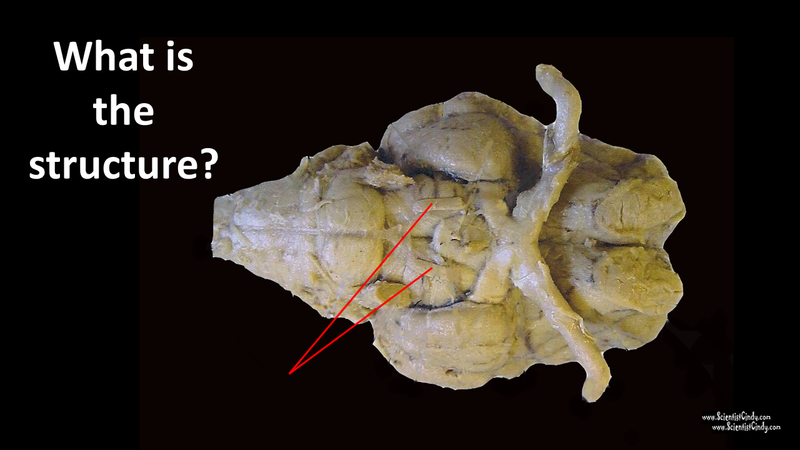 The subunits differ in size, but the function remains the same. 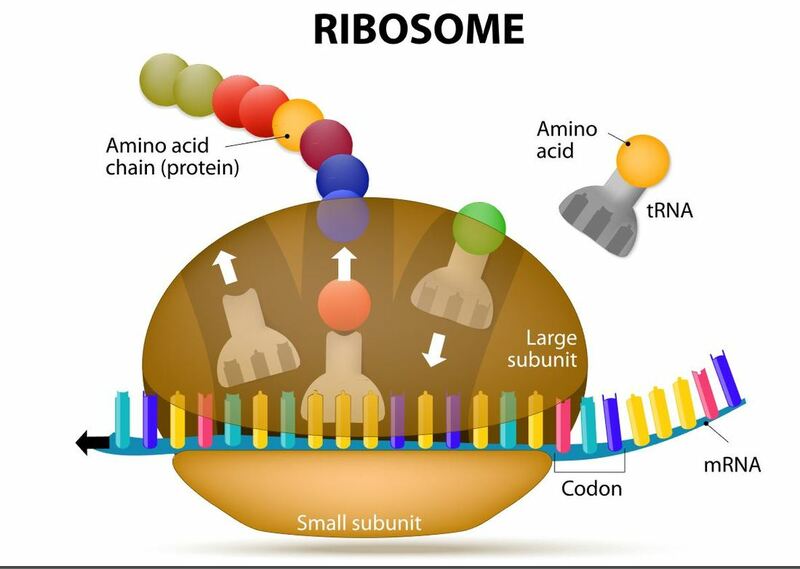 Ribosomes function as the site of protein synthesis in both eukaryotic and prokaryotic cells. Prokaryotic cells do not have membrane-bound organelles. This means that prokaryotic organisms will not have a rough endoplasmic reticulum that holds some of the ribosomes, like we see in eukaryotic cells. Elongation is the process by which amino acids are added to the amino acid sequences via peptide bonds. The amino acid chain will continue to grow and will shift in position within the ribosome. Termination of protein synthesis occurs at the stop codon. There are three different codons which are considered stop codons (UAA, UAG and UGA). When one of these stop codons reaches the ribosome, the last amino acid will break free from the ribosome and from the tRNA. The protein is now complete. Remember that proteins are molecules that are essential for metabolism and are used to build structures within the cell. 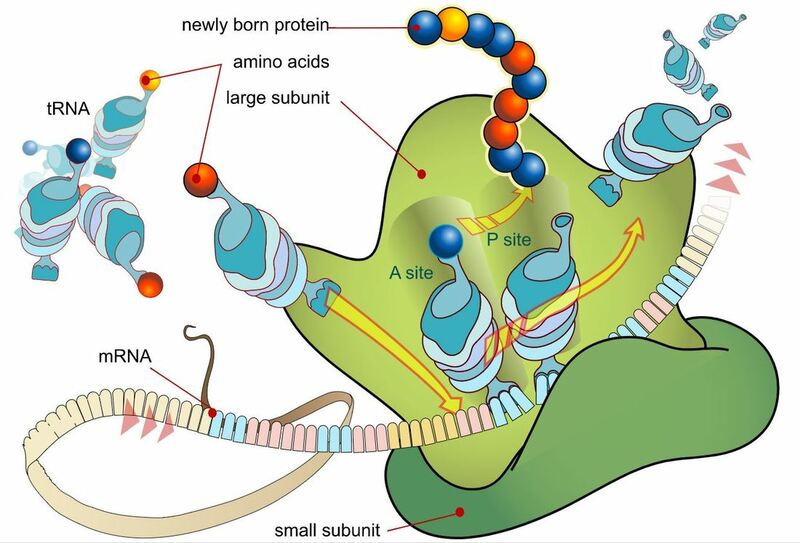 Proteins are composed of a long string (a polymer) of individual units called amino acids. The amino acids are joined together like beads on a string to make the protein. Eukaryotic cells include animal cells, like the one shown in the illustration here. Eukaryotic cells have a nucleus and have membrane bound organelles. Viruses are considered to be a "true parasite". A parasite is an organism that depends completely on a host organisms for its survival and reproductive processes, and does so at a cost to the host. Viruses are completely dependent upon a host for their survival because they do not have any enzymes or ribosomes. Viruses are much smaller than bacteria. Each virus is made up of genetic information which can be either RNA or DNA. The genetic material is surrounded by a protein coat that is called the capsid. ​ The capsid is made up of proteins called capsomeres. The capsomere is a subunit of the capsid, an outer covering of protein that protects the genetic material of a virus. Capsomeres self-assemble to form the capsid. In addition to the capsid, some viruses also have another structure called the viral envelope or coat. The viral envelope consists of a lipid bilayer derived from a host cell. In addition to the lipids, the viral envelope will also contain elements of the host cell's membrane that gives the virus some type of survival advantage. For example, the viral envelope may give the virus access to specific cells or may assist the virus in evading the host's immune system. The viral envelope can contain regions of membrane that allows the virus to enter the host cell via endocytosis and to leave the host cell via exocytosis. The life cycle of a virus depends upon the successful invasion of a host cell. Let's take a look at how viral reproduction takes place. A virus is an intracellular parasite that can reproduce only by taking over a host cell. A virus is composed of an nucleic acid genome (RNA or DNA) enclosed in a protein shell called the capsid. Some viruses are covered by a viral envelope in addition to the capsid. The viral envelope is made from the membrane of the host cell. The Lock-and-Key Mechanism Requires that the Capsid Proteins Have the Correct Complimentary Shape in Order to Bind to a Receptor on the Host Cell. ​ Once the viral DNA/RNA enters the host cell, the viral DNA/RNA will use the host cell's nucleotides and enzymes to replicate itself making more copies of the viral genome.. The lytic cycle results in lysis of the host cell, which ends in death. In the lysogenic cycle, the viral genome enters the nucleus and inserts itself into the host genome, keeping the host cell alive. 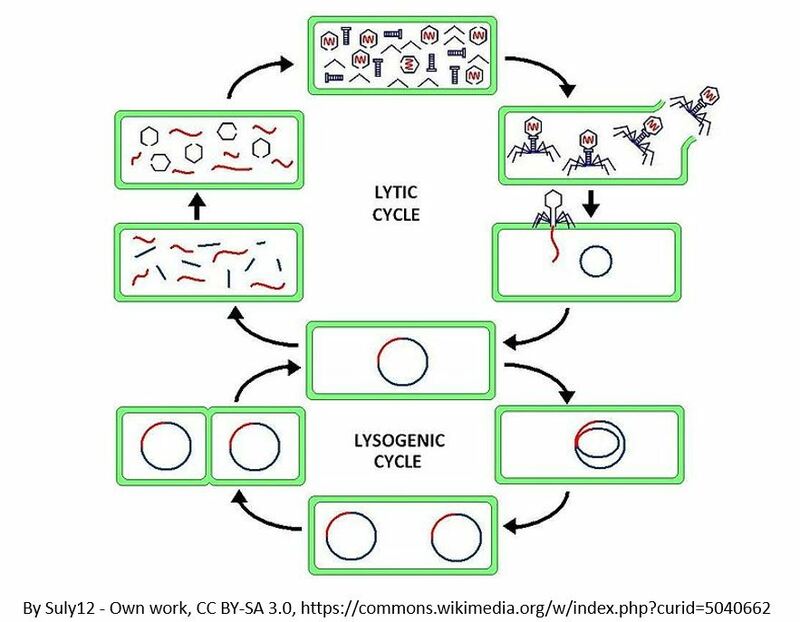 Let's look at an overview of the lytic cycle. The virus docks onto the host cell and attaches to the host. Most often, then is done through a lock-and-key mechanism which involves a viral protein binding to a specific receptor on the surface of the host cell. Once attached, the virus injects its genome into the cell. The viral DNA (or RNA) takes over the host cell's nucleotides, and enzymes, along with its machinery, and makes copies of itself. The viral DNA is transcribed into messenger RNA (mRNA) which is then translated into protein. The viral copies create osmotic pressure that drives the extracellular fluid into the cell. The build up of pressure results in lysis of the cell. This is when the host cell bursts open, and the newly created viruses are released into the extracellular environment. These new viruses are now free to infect other host cells, and repeat the lytic cycle. Once all of the viral building blocks have been made, the viral components will self-assemble to form new copies of the virus. This process continues (more and more viral copies are made until the host cell can no longer sustain life. The new viral copies will produce a substance called lysin, which is an enzyme that functions to weaken the structural integrity of the cell wall. The build up of pressure results in lysis of the cell. This is when the host cell bursts open, and the newly created viruses are released into the extracellular environment. Let's look at an overview of the lysogenic cycle. using this method are considered "temperate" viruses. First, the phage infects the host bacteria. Then, the viral DNA (or RNA) will be inserted into the bacteria host. The Viral DNA is then going to incorporate itself into the host cells genome. 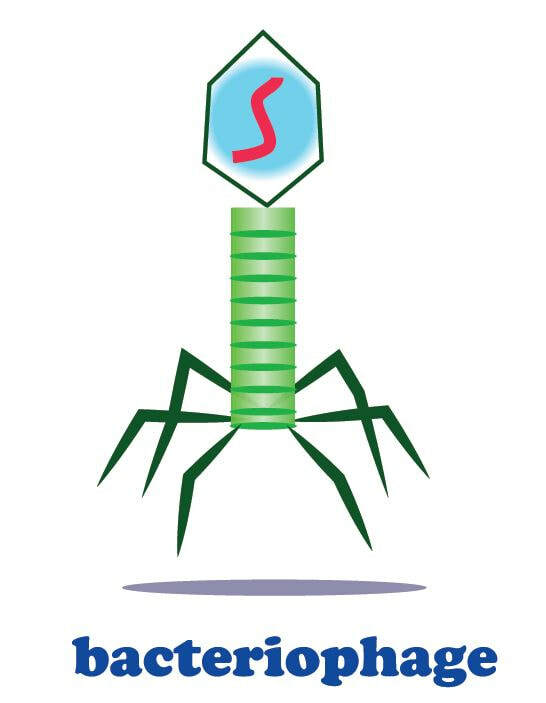 Once the virus's DNA has been incorporated into the host cells DNA, it is now considered a prophage. 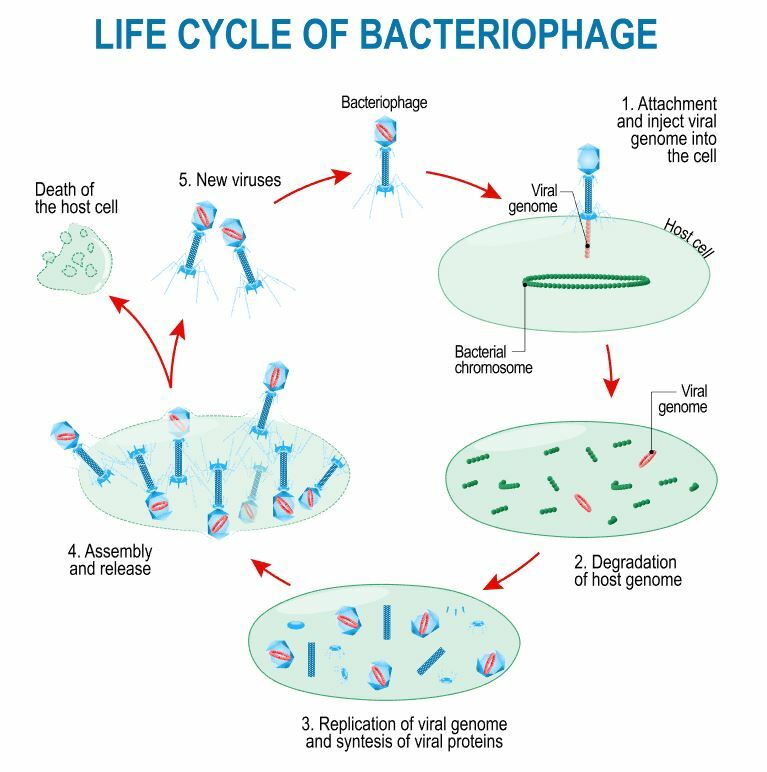 After some time has past, the prophage will exit the host cell's genome and the virus will begin to undergo the deadly lytic cycle. Some viruses are classified as retroviruses due to the way in which they reproduce their genetic material in the host cell. Arguably, the best known retrovirus is the human immunodeficiency virus (HIV). The HIV virus is called a retrovirus due to the way that it reproduces in the host cell. HIV virus infects white blood cells. 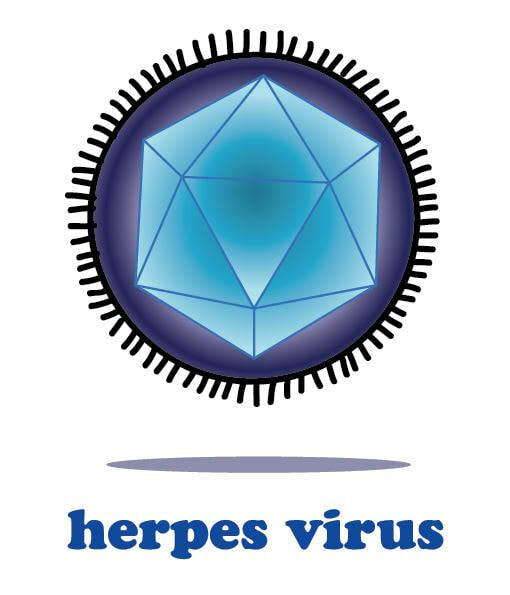 The HIV virus has a viral envelope that surrounds the capsid. ​ The viral envelope is composed of pieces of the host cell's membrane. The viral envelope allows the HIV virus to enter the host cell (white blood cell) through endocytosis. In addition, the viral envelope will also enable the virus to exit the white blood cell through exocytosis. Reverse Transcription Takes Place in Retroviruses Due to the Enzyme Reverse Transcriptase. This Allows the Viral RNA to Be Used as a Template to make a Double Stranded DNA Molecule. 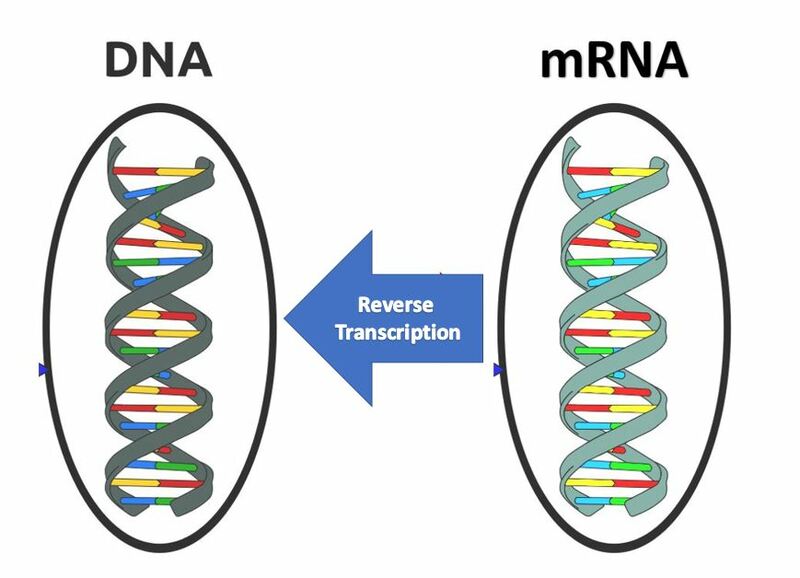 Once the viral RNA has entered the host cell, reverse transcriptase is going to "reverse transcribe" the viral RNA into DNA. After the viral DNA has been created, it will incorporate itself into the DNA of the host cell (the helper t-cell). At this point, this is called a provirus. Every time the white blood cell goes through protein synthesis, new viral RNA is generated. The viral RNA that is generated will eventually be used to assemble new HIV viruses inside the white blood cell. The viruses will exit the white blood cell through exocytosis.